Worked flawlessly on Ubuntu 12.04 + Lubuntu desktop on Amazon AWS. Thanks! I would like to test it, but I can’t download it from git. It want user/pass. I’m newbie with git and sorry for maybe stupid question. I have no idea why it would be asking you for a username/password. Did you copy/paste exactly the “git clone” line I give above? Then I copied from /etc/xrdp/xrdp.sh to /etc/init.d/ and ran sudo update-rc.d xrdp defaults. Problem is that after xrdp start, it says : xrdp is not executable. From xrdp file, it stop on “if ! test -x $SBINDIR/xrdp”. But I think I have problem with path somewhere. Try this : http://github.com/scarygliders/X11RDP-o-Matic/zipball/v3.0beta3 and re-run the tools. As I wrote, I had something wrong with xrdp, so remove, install, remove help. Next error was with Log file (var/log/xrdp.log). It wasn’t there, so I created a then it worked! So very thanks for this:) It really work! And sorry for spamming here. No Need to apologise – every bit of feedback is useful! Thanks for a good piece of work! It works well for Ubuntu 12.04 on a Hyper-V server. The only issue I’m worried about is mouse scrolling, which is virtually unusable. I’m connecting from a Mac using Microsoft RDP Client 2.01. Have you experienced or know about any problems with scrolling, and perhaps give some advice? You might want to ask in the xrdp-devel mailinglist, where Jay Sorg and the other contributors to xrdp are usually quite good at answering queries hang out. Details are at https://lists.sourceforge.net/lists/listinfo/xrdp-devel . 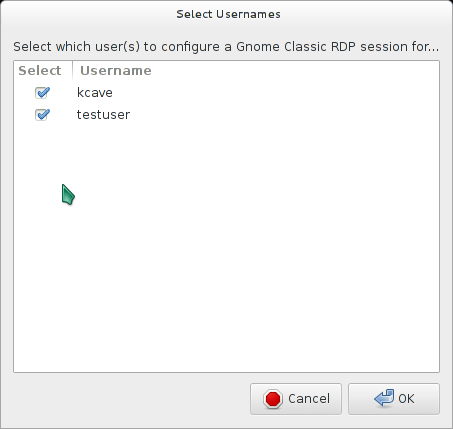 Do ANY of your scripts or your work with xrdp fix the issue of disconnected sessions hanging around? The sesman.ini settings don’t do anything and I have not found a valid workaround. I have been trying to fix this for 3-4 versions of Ubuntu/Mint with no success. I run a Linux Mint virtual machine with less “lockdowns” that is outside our firewall that our users can connect to and browse the internet in a less locked down environment. There are never more than 7-10 people at any given time signed on browsing, but over the course of a days work there may be 50-100 people that have signed on at one point or another. It crashes the machine because it refuses to tear down connections when someone disconnects. So I have to have scripts that reboot the virtual machine every hour or two. This of course kills ACTIVE sessions instead of inactive ones. My script is essentially a build tool, the actual functionality is provided by the resultant compiled binaries/system, so, no, my scripts don’t directly affect how xrdp behaves after compilation/installation – apart from RDPsesconfig which of course configures what desktop a user will get upon login. How are your users ending their sessions? Are they actually logging out? Or are they just closing their RDP client? If it’s the latter, then of course the RDP session will hang around until that user reconnects to it. Have you looked at /etc/xrdp/sesman.ini ? There is an option there to kill sessions on disconnect, which sounds like what you want. Have you tried that? Thanks for the reply. Yes, I’ve tried that setting but all the documentation online for the sesman.ini seem to indicate that killdisconnected is not fully implemented so doesn’t actually do anything yet. I can verify that behavior in my testing. Yes, you are right my users are clicking the X to close the RDP window instead of logging out even despite training and threats against their family. There simply needs to be a technological solution because I can’t depend on users to do it properly. Like I said, there are never more than 8-10 concurrent users at most, but over the course of a day that can be 50-100 unique users with most of them having sessions hung open. Giving the virtual machine more RAM just increases the amount of time before it fails. I suggest asking in the xrdp development mailing list, as I suggested to another chap, above. Details of this mailinglist can be found at : https://lists.sourceforge.net/lists/listinfo/xrdp-devel . Other than threatening your users further, I don’t know if anything can be done in an automated fashion – perhaps a cron job called script could be written to look for disconnected sessions? Now, in xrdp.log, the number 37106 is the port number used for the connection. And in xrdp-sesman.log, the 8043 is the PID number of the X11rdp server back-end for this session. It’s at this point you can tell that a connection has been lost, and then you can use the kill command to kill off the X11rdp process (PID = 8043), hence completely ending that session. Hi, I installed the beta on mint 15 and can connect to it via rdp on my win7 machine, but the session "freezes" when I try to drag a window on my desktop. Whenever I use the vnc option instead of x11rdp everything works. If it's freezing whilst using mstc on Win7, then I'd probably tell Jay Sorg (who writes the X11rdp back-end) about it, on the xrdp-devel mailinglist, which I've mentioned in comments above. I’ve used scarygliders in the past and had no problems on ubuntu. Just did a git on the most recent v3 and installed it. I specific LXDE and then ALL USERS and the “Creating .xsession files displays the following which doesn’t look right as all the .xsession entry’s use an entry of “” ?? Creating .xsession file for 80×25. in with entry “”.. Creating .xsession file for ALL in with entry “”.. Creating .xsession file for USERS in with entry “”..
What distribution did you run o-matic on? Someone else had a similar problem if you read the replies in the v3.0 proper post – basically it was because they didn’t have “normal” users and didn’t select them for configuration – try just selecting your actual users that will log in via RDP. If you tell me what distribution you tried this on, I’ll try it in a VM and see where the RDPSesconfig user pick routine is failing to ignore system users – it shouldn’t be, or wasn’t in the past – I’m quite proud of that wee bit of code ;) It may be that the user-pick routine I wrote way back has to take additional steps to ensure system users in more recent distros don’t get added in as users to be configured.